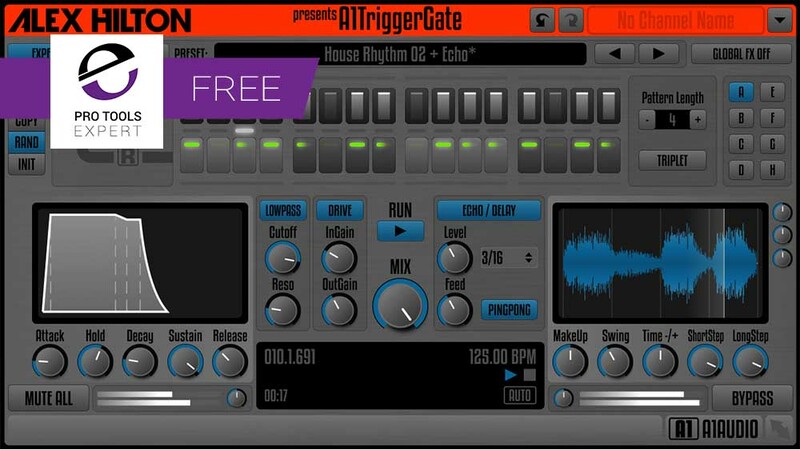 In this week's Friday Free Plug-in, we are featuring A1 TriggerGate by Alex Hilton. When I first looked at this I was struck by how "homebrew" it looks. It took me back to the days before UI design and rendering was the job of a specialist. After installing I noticed the UI was a little jerky on my system but having played with it for some time I decided to run it in the Friday Free slot as it proved to be perfectly stable on my system and I concluded that although it's not pretty, it's much more fun than editing automation playlists! Try it. You might like it. Each section of step length buttons & step volume faders represents one beat of your pattern sequence. You can choose between 'NoStep', 'ShortStep, 'LongStep' and 'StepLink' by simply pressing a step length button. Each beat consists of 4 steps (1/16 notes in 'Normal Mode') or 3 steps (1/8T notes in 'Triplet Mode') and each step has its own step volume fader above to dial in its relative level. The integrated FX (Lowpass Filter, Drive/Distortion and Echo/Delay) are designed as easy as possible. Simply turn it on and tweak it a little and you're ready to go. If you are looking for the right groove or just an interesting rhythmic pattern, sometimes it is a good way to let my plugin provide you with some random patterns. Just press 'random' several times and use the sequence you like. It's simple as that! To get your copy of this plug-in go to the Downloads page of Alex's site and select the appropriate installer - No sign up required.